One day a group of animal lovers lobbied for the right to keep alligators to protect their property against other people who had bigger alligators. 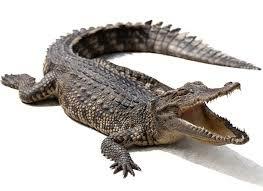 It was illegal to keep alligators, although many people did so. The constitution of the country was amended to protect their right to own alligators. And so the animal lovers created an organisation called the National Reptile Association (NRA). Being under no threat any more, the alligators multiplied in numbers. Some people had so many alligators that they could no longer feed them all. So the crocs escaped from their cages and disappeared into the swamps, rivers and dams. Alligator owners were not worried, because they just made sure they had the biggest alligators in the neighbourhood. Before long, the first attacks happened. Innocent people were attacked in their own homes. Crododiles are not good at distinguishing between friends and enemies. It was mostly the men’s alligators that attacked the wives and in some cases even the children. When the first child got killed by a alligator, all hell broke loose. The media reported on the shocking attacks, but nobody blamed the alligators or their owners. They defended the second amendment to the constitution. They persuaded the government to remove all obstacles that could harm the alligator industry. The more alligators everyone had the safer the whole country would be, was the argument. Alligator breeders made huge profits and became very, very rich. There was no restriction on who could own a alligator. Even a 12 year old could keep as many alligators as she wanted. Nobody could control the NRA and the alligators any longer. They became bigger and more aggressive. Brazen attacks became a daily reality — in homes, in nightclubs and public spaces. Their favourite feeding spots became schools and campuses. Scores of people died. The students rose up, marched through the streets and shouted: Enough is enough! But nobody heard. The lawmakers played golf. When asked for his comment, the President responded by sending more alligators to teachers to protect the rights of alligator owners. Because it’s not a alligator problem, can’t you see?